An 88,000-tonne US aircraft carrier carrying nearly 5,000 sailors has arrived in the Solent. 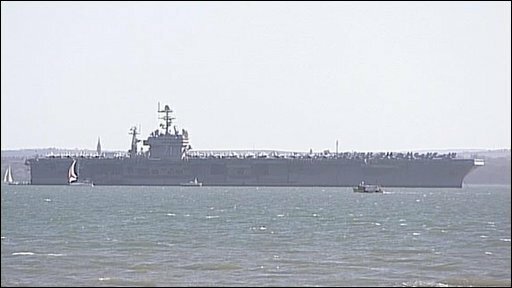 The 4.5-acre (1.8-hectare) USS Theodore Roosevelt warship is anchored off Stokes Bay because it is too big to dock at Portsmouth's Royal Navy base. The sailors are due to disembark the ship in Portsmouth later this week to "reinforce the strong friendship" with the UK, the US Navy said. They are due to tour the local area and take part in local activities. The USS Theodore Roosevelt and its accompanying ships have spent the last five months supporting ground forces in Afghanistan. During its visit to the south of England, the warship will also host UK military and government officials for a visitor tour. The visit will include an air demonstration followed by a reception.